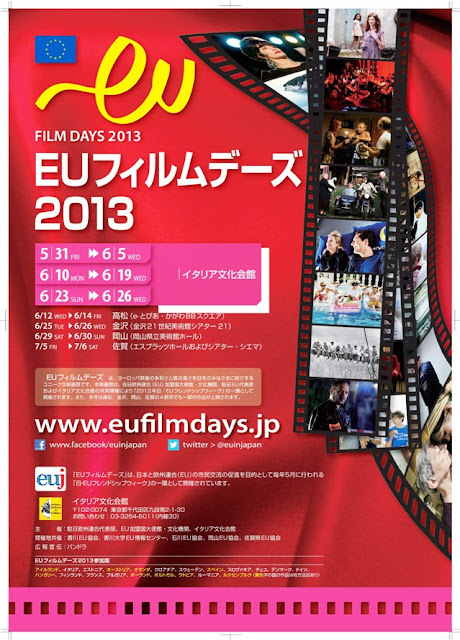 Co-organised by the Delegation of the European Union to Japan, EU Member States embassies and cultural institutes in Japan, and the Italian Institute of Culture, EUFilm Days brings the best of European cinema to audiences in Japan. This unique festival is held as part of EU-Japan Friendship Week, during which a wide range of activities and events are held across Japan celebrating relations between Japan and Europe. For the eleventh edition of EU Film Days, films from 21 EU Member States as well as from Croatia which is due to join the EU on 1 July, will be shown at the Italian Institute of Culture in Tokyo (two to three screenings per day) from Friday 31 to 26 June (see schedule for details). Each film will be screened twice during the period of the festival. Additionally this year, films from 9 EU Member States will also be screened in Takamatsu, Kanazawa, Okayama, and Saga. This year's selection of films, many of which are being shown for the first time in Japan, have been chosen in order to exhibit the wide range of film-making talent in the soon to be 28-Member State European Union as well as the cultural diversity that the EU maintains. We hope that many of you will enjoy this opportunity to experience the distinction and diversity of European film-making. The Portuguese film “Amália the Movie”, directed by Carlos Coelho da Silva in 2008, will be shown on 11th June (19:00) and on 16th June (14:00) with English and Japanese subtitles. The film is about the life of Amália Rodrigues, the Queen of Fado. This will be the first time for the film to be shown in Japan and it will itinerate to Okayama and Saga, after Tokyo. Filme "AMÁLIA" no "EU Film Days 2013"